Dan Mirkin arranged the charter from Sunsail/Tahiti. We picked the boat up at their base in Raiatea. We explored Tahaa, the island north of Raiatea, and Bora Bora. 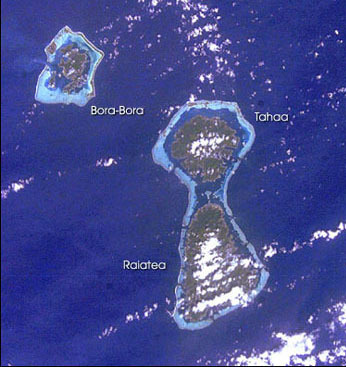 A map showing the general location of these islands and a satellite photo of the islands are shown below. Click on the left panel to see routes for Days 1-8.